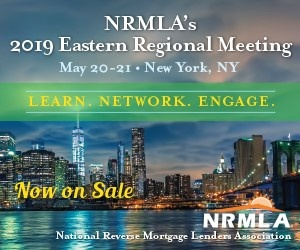 As lenders prepare for the “new” reverse mortgage landscape including marketing a product with more rules and requirements than ever before, the market for non-agency reverse mortgages is beginning to take shape. With a temporary extension of higher loan limits set by the Federal Housing Administration, the opportunity for a proprietary reverse mortgage has existed largely in the jumbo market, for homes valued well above the current loan limit of $625,500. Yet with recent changes to principal limit factors for Home Equity Conversion Mortgages (HECMs), cutting the amount for which borrowers can typically qualify by around 15%, lenders say they are taking a new look at the potential for additional products and new opportunity. The challenge lies in finding an investor. Without a product to sell, it’s difficult to inform investors of the opportunity. Yet without the investor, it’s difficult to get a product off the ground. Educating investors is a first step toward creating a viable product, those in the market say. Recent headlines have raised uncertainty among investors, such as the recent FHA draw from the Treasury to cover losses associated with HECM loans. “We’re going to have to convince the investment community these securities will perform well over time,” McCully said. Yet there are some positive signs of among the investment community. Recently, three private reverse mortgage interest-only (IO) securities traded in the secondary market at better levels than expected, said Bryan Faron of Brean Capital. The only example currently in the market is Generation’s jumbo reverse mortgage, the Generation Plus. The loan is “ideal for seniors who own higher-valued homes with appraised values between $500,000 and $6 million,” Generation says on its website. While Generation doesn’t have current plans to change its offering, there are some indications of what new non-HECM reverse mortgages might look like. “A proprietary product doesn’t have FHA insurance, so insurance has to come in the form of excess spread and extra equity. [In other words], the interest rate is higher, and the loan-to-value is lower,” McCully said. Creators of a new product will likely take cues from FHA as to structuring new products and protecting their investors. In terms of the actual borrower amounts, the sweet spot lies somewhere above the current FHA lending limits, but likely with a lower loan to value ratio. Loan limits have been temporarily extended through 2013, but are expected to return to $417,000 upon sustained economic recovery. Several lenders are rumored to be working on new products and seeking an investor for when the product rolls out. One such company, American Advisors Group, says it is working toward the release of a new product early next year. AAG has been mum on the details, but says it is bullish on the opportunity the current market presents. The potential is made greater through referral channels that have recently begun to gain traction in reverse mortgage products, he said. Whether new products will come to market in early 2014 remains a question of the investor, but lenders are sure of the new opportunity it presents.